In case you're interested I reviewed this lens on thewsreviews.com. Basically I gave the 'R' lens a very good recommendation, but you'll have to read the complete review for the details. I'm going to expand on a few observations made of the 'R' version at thewsreviews and take more of an editorial/grumpy opinionated tone in the process. As I noted on thewsreviews this is an all-plastic lens from bayonet mount to lens shade mount at the seeing end. The only parts that aren't, obviously, are the lenses and the electrical (focusing motor) and electronics. Olympus isn't the only camera manufacturer to do this; the vaunted Canon and Nikon sell kit zooms that also have plastic mounts. But that doesn't make it any more acceptable in my book. I mentioned in the review about how I held back purchasing this lens because it was selling for $300. If the lens had had a full metal bayonet (and maybe a little more plastic? ), I would have purchased a copy then instead of waiting for the price to hit $160 on Adorama. I want metal on the bayonet for two reasons: strength and durability. Strength comes into play when you're slinging the whole assemblage of lens and body around; the mount is the weakest link and will see all the forces of twisting and moving the camera and lens combination around. Fortunately for this lens, there's very little lens mass to worry about. Durability comes into play when mounting and unmounting the lens. I wrote that the 'R' version mounts "snugly" on the E-P2. That's right now, while the lens is effectively still new. I tend to change my lenses a bit on my interchangeable lens cameras, so I'm curious to see just how long this bayonet will last under my usage. I hope for a good long time. I know that every other lens I own, including those purchased over 40 years ago with metal bayonets still click smoothly and snugly into place. So in case you haven't figured it out already, I don't like plastic bayonets on my lenses. Rather than beat this particular dead horse Yet Again and annoy the reading public over on thewsreviews, I came back into my cave to vent. The 40-150mm lens concept is pretty powerful regular 4/3rds, and that power caries over onto µ4/3rds systems. It is the focal length equivalent of 80-300mm on 35mm cameras. A zoom with a 4:1 zoom range and 300mm on the long end is quite useful. The sins of a plastic bayonet are mitigated somewhat by the small size and very light weight of a lens that zooms out to 300mm. I know this because I have an Olympus OM 300mm f/4 lens that weighs more than two E-P2 + 40-150mm zoom combinations. Light weight and compactness have to be taken into consideration. As I noted in the review, the 'R' version of this lens is smaller in diameter than the Mark 2 version, while being a bit longer. I have a theory that what you're seeing is the effective length of the MMF-2 adapter built into the 'R' version (and the earlier MSC/Mark 3 native µ4/3rds version as well). Why? Nobody talks about it much anymore, but one of the early selling points of the 4/3rds system was telecentricity, or as Olympus advertised, "near-telecentric optics". Telecentricity was the attempt to design lenses that would align rays coming out of the exit pupil of the lens to be as perpendicular to the sensor as possible. You wanted your light rays as perpendicular as possible to minimize vignetting in the corners of the image. 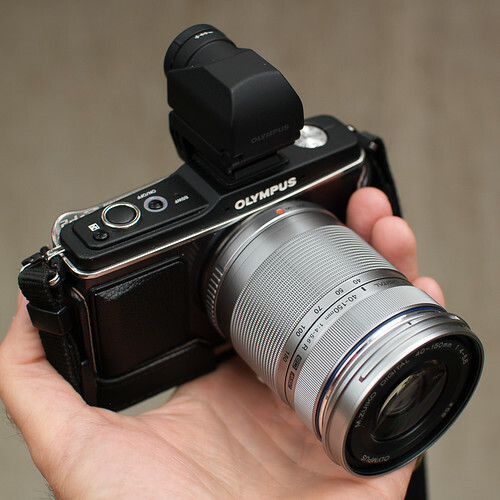 While the debate rages in some circles to the effectiveness of this design, I will say this: I have seen the quality of Olympus optics, and it is because of Olympus glass that I stay with Olympus digital cameras. Whether that quality is due to "near-telecentric" optical design, I can't say for certain. I back this theory up with one final observation; flip the 'R' lens over and look at the exit pupil of the lens, and see that it's recessed into the rear of the lens. The Mark 2, by comparison, has its exit pupil flush with the bayonet edge. Whatever the case, the 'R' 40-150mm optically performs every bit as well as the regular 4/3rds lens with an adapter, and I don't think the longer length of the µ4/3rds version is an accident. The greater length is the 'R' over the Mark 2 is even more pronounced when both lenses are extended to their full focal length of 150mm. 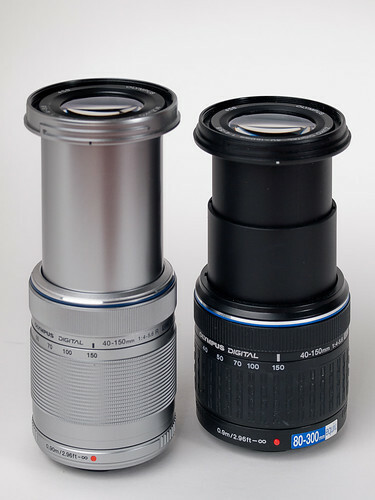 The designers of the 'R' lens also cleaned up the two-piece design of the Mark 2's inner lens barrel. As a consequence the 'R' lens feels more solid racked out to 150mm. The inner barrel of the 'R' is also more tightly seated, or at least it appears and feels that way. There's none of the "rattly" feel of the older Mark 2. But then again, when using the older Mark 2 with the MMF-2 adapter, I never felt I got poor quality photos from the older 40-150mm. The Mark 2 is good, but the 'R' just seems better. 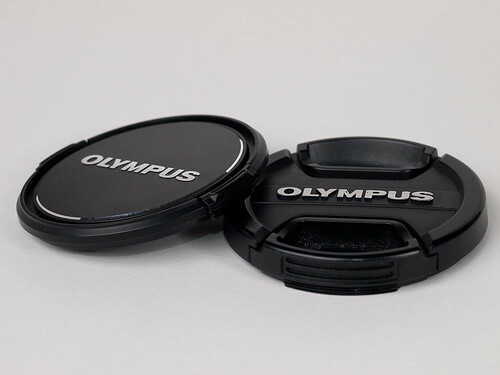 If there's one thing I will complain about it's how cheap Olympus has gone on its lens accessories. Every older 4/3rds lens came with a lens shade and a center-pinch lens cap. For High Grade lenses you also got a pretty decent lens case/bag (which, unlike some people I know, I actually use). Even my Sigma 30mm came with all the aforementioned accessories. But not Olympus' µ4/3rds lenses (and to be fair, Panasonic is just as cheap). The only thing you get are the front and back lens caps, and that's it. Even the front lens caps have been cheapened. 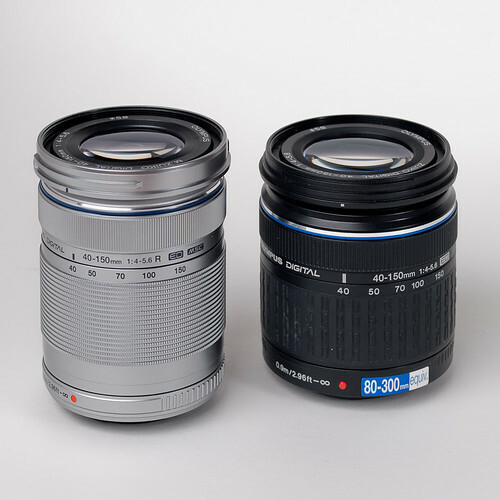 Note that 'R' front cap on the left, compared to the older Mark 2 front lens cap on the right. I should note at this point that both lenses have 58mm filter rings, so the older Mark 2 cap fits just fine on the newer 'R' version. At this point I would shrug my shoulders and say "what did you expect with a cheap lens", except I know what to expect because Olympus set the standard with its regular 4/3rds versions. What makes it really bad is that this is policy on all µ4/3rds lenses, regardless of price. I have the M.Zuiko 45mm that came with nothing but cheap caps, and if I want to purchase the M.Zuiko 12mm for $700, it's only going to come with cheap end caps as well. I guess this is a cost cutting measure to help pay off all those bad investments Olympus made 10 and 20 years ago. The Olympus 40-150 lens, in all of it's various guises, is, I think, the best value in all of digital photography. Considering it is nothing more than a kit lens, designed cheaply as possible as to move more cameras with an included "two lens kit" -- it really gives the photographer much more than it's cheap construction would indicate. When you get right down to it, the two things this lens excels at is image quality and versatility. Both are delivered in spades, in a package so small, you'd be foolish not to pack it along where ever you go. I'm glad Olympus finally decided to make a 40-150 especially for the micro 4/3 mount, and I think it's a lens every Olympus Pen user should buy. In many ways, it's really the perfect telephoto zoom for the system. All comments are checked. Comment SPAM will be blocked and deleted. A Sign of Possible Economic Recovery?